For the past ten years, Disney/Marvel has produced eighteen feature films showcasing the likes of our favorite Marvel superheroes. Jon Favreau’s Iron Man was a surprise blockbuster in 2008 carried by a career-resurrecting performance by Robert Downey Jr. and the creative minds at Disney/Marvel (see: Kevin Feige) knew they were on to something. I mean, when Samuel L. Jackson showed up in the post-credit sequence (beginning the new trend of bonus scenes of what’s to come for the fans) talking about forming a super-team, who could have imagined we’d be where we are today – ten years later? It’s been a long, incredible journey to Avengers: Infinity War, and we’ve been spoiled with quality films (and television) throughout. Sure, there are some bumps in the road, but even at their worst, the lesser-appreciated films in the Marvel Cinematic Universe still aren’t bad films and fans kept continuing to flock in and shatter box office records over and over again on each new release. Infinity War will be no exception to this formula and will undoubtedly become the second Disney/Marvel film to reach a billion dollars this year following Black Panther and deservedly so. Infinity War picks up immediately where the mid-credit scene in Thor: Ragnarok left off back in November. Thanos, the large, purple-skinned muscular Titan (voiced and motion-captured wonderfully by Josh Brolin), is in search of the six infinity stones that we’ve seen, heard of, and theorized over in the past decade of films and his first stop is with Thor and the remaining Asgardians. With even two of these stones in his possession, he’d be the most powerful being in the universe. With all six, he could snap his fingers and wipe it out – and that’s entirely what he means to do to create balance. Up until this point in the MCU, Thanos has only made his presence felt through dialogue and giving orders in a few quick scenes here and there – most notably in Guardians of the Galaxy. In this film, however, he makes his physical presence known near immediately and clearly poses to be the toughest challenge yet for Earth’s mightiest heroes. What’s worse? Most of them don’t even know he exists. Since the Russo brothers’ last directorial effort in the fantastic Avengers 2.5 (or Captain America: Civil War, as it’s actually titled), there’s a rift in the team and Tony is no longer on speaking terms with Steve Rogers (Chris Evans, who’s return gave me actual chills for the first time in this film) and the Avengers are spread out throughout the world (and galaxy, for that matter). There are a lot of scenes transitioning from one location to another playing catch-up with the characters, but the Russos never make you feel lost in any of it by including a subtitle as to where everyone’s at. Thankfully, it’s not an entire screen’s worth of obnoxiously large text as it appeared in Civil War either. 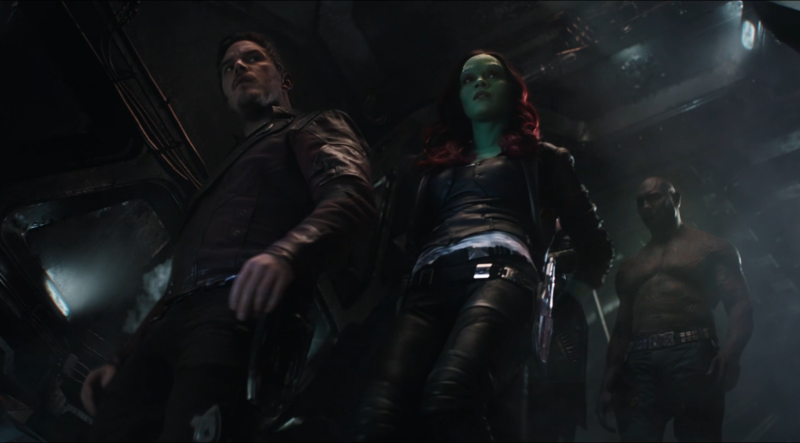 Speaking of which, after leaving New York, it might have been a teeny-bit unnecessary to inform the viewers that we’re now in “Space” when introducing our favorite cosmic outlaws, though doing so fits the comical and sarcastic tone of James Gunn’s Guardians of the Galaxy perfectly. Yes, Star-Lord (Chris Pratt), Gamora (Zoe Saldana), Drax (Dave Bautista), Rocket (Bradley Cooper), and an adolescent, video game loving Groot (Vin Diesel) become part of the bigger picture for the first time since their introduction into the MCU. Gamora, an adopted daughter of Thanos, has a huge role to play in attempting to stop him. She the focal point of the Guardians’ arc in this film and Saldana does a fantastic job displaying a wide array of emotions throughout. While the film is much more serious in tone than the previous films, it’s hard to have the Guardians in anything without bringing some quirky comedy. Star-Lord and Drax probably deliver my two favorite laugh out loud moments in the film. 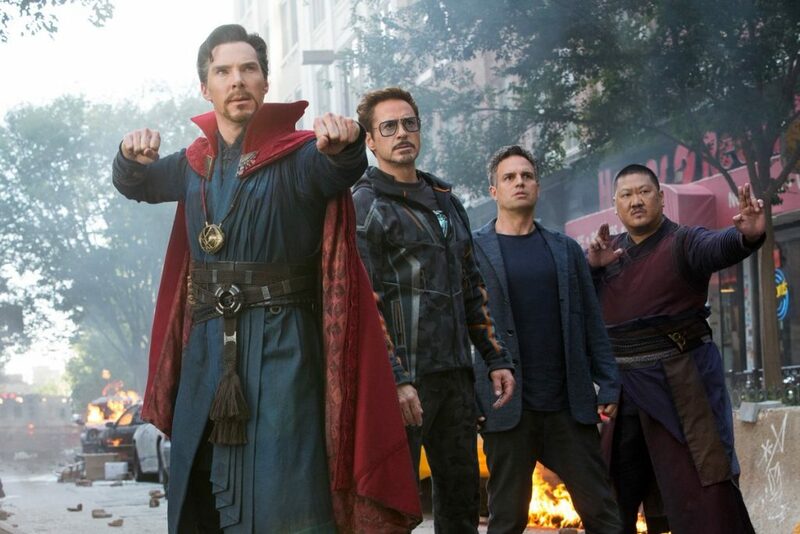 Mark Ruffalo’s Bruce Banner plays as the messenger for Thanos’ impending attack, bringing Tony and Dr. Steven Strange (Benedict Cumberbatch) together for the first time since Strange’s introduction in 2016. I’ve found Ruffalo’s introduction into the series with the very first Avengers movie to be a welcomed addition, but since then I’ve begun liking his character less and less, unfortunately. In Infinity War, aside from being the one to bring the Avengers together, his character is played off as comic relief throughout the film. It didn’t really work for me, especially considering that throughout the film’s entirety, he’s battling with himself to turn into the big green monster we all want to see (which, of course, contradicts his fear in Ragnarok about turning into the Hulk and never being able to return to Banner again). Granted, the universe and its existence weren’t at stake in Ragnarok, but it definitely felt like a sudden change in character once again and left me a little perplexed. That being said, it’s really my only complaint about the movie after an initial viewing and part of me just thinks it’s nit-picking. Infinity War has everything you could want and expect in it, but it will still manage to surprise you. 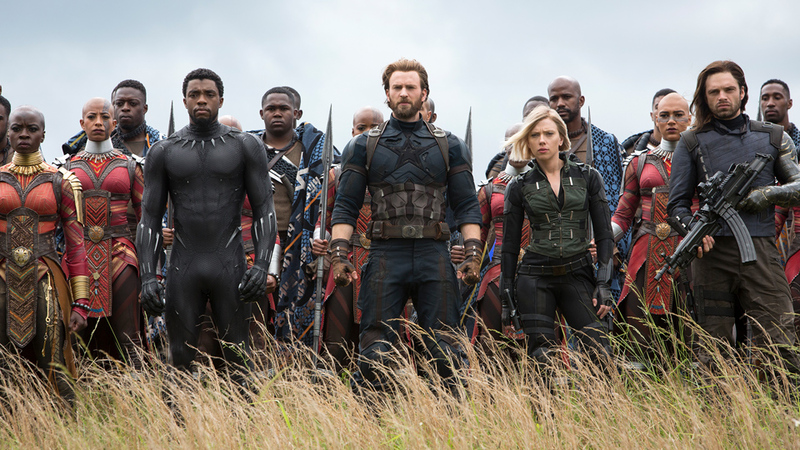 The action is top notch throughout, but most notably a climactic third act battle of armies in our most recently visited nation, Wakanda, is a standout amongst others. There is also, of course, a Stan Lee cameo that will bring a smile to your face very early on. What Infinity War also does is something that I hadn’t felt with any of the previous films though. It packs a very mean punch and provides a feeling of overwhelming dread consistently throughout its two hour and forty minute runtime. There’s hope. Then there isn’t. There are laughs. Then there are tears. Sure, previous films have had heartbreak and despair, but not like what we get here. 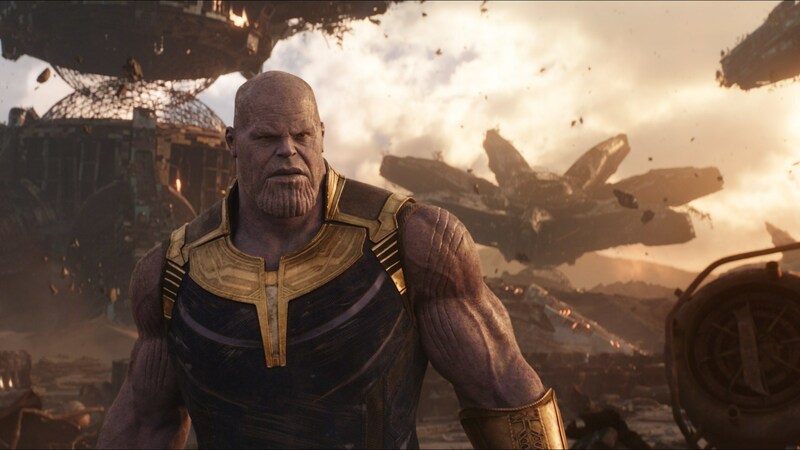 From the opening scene, Thanos makes it clear he’s a force to be reckoned with and by the film’s end, he certainly proves it to be true. Most of the time with these movies, you just know your hero is going to make it out of these sticky situations one way or another, but that’s not the case here. Not in the slightest. This is the most somber and heartbreaking of the nineteen films we’ve had and leaves its viewers stunned and silent as the credits begin to roll. Congratulations, Marvel. You’ve earned this and I can’t be more thrilled to just have been along for the ride.